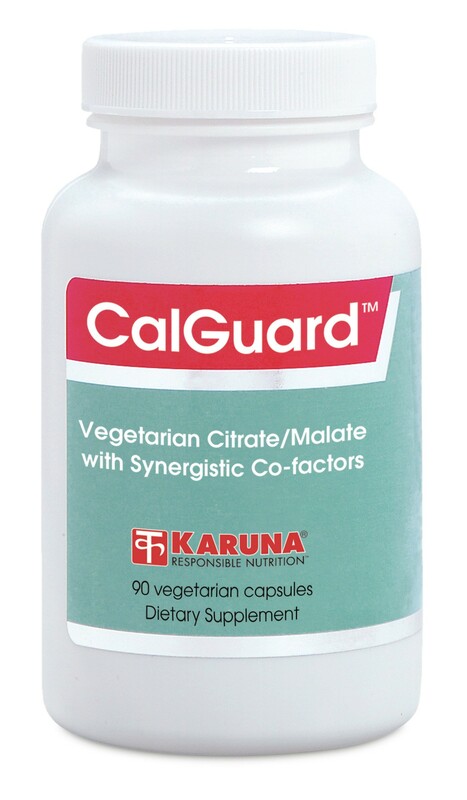 CalGuard provides well-absorbed vegetarian calcium from a citrate-malate source, balanced with magnesium and other bone-building nutrients. A generous amount of vitamin K is included, far more than in most other bone support products, and vitamin D is supplied in the preferred D3 form for maximum bioavailability. These nutrients, along with vitamin C and manganese, work together to support optimal bone density and help skeletal structures maintain their integrity during minor traumas. Calcium delivered as a citrate/malate salt has been documented as the best absorbed form of calcium in virtually all comparative studies (J Am Coll Nutr 1990;9:583-7; Calcif Tiss Int 1987;41:351-2) and may be the most effective for maintaining bone mass (N Engl J Med 1990;323:878-83).